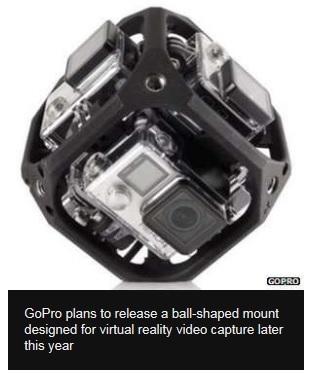 “Mr Woodman (of Go Pro ) also showed off a prototype mount that can hold six of his firm’s Hero4 cameras, each pointing in a different direction. He said the resulting footage could be stitched together using software developed by Kolor – a start-up it bought last month – to create a single 6K-quality 360-degree image. This could then be used with virtual reality helmets – allowing a user to change their perspective by turning their head left and right and looking up and down – or via YouTube and Facebook, which are both adding support for interactive spherical videos. The Six-Camera Spherical Array add-on will go on sale later this year. Facebook plans to offer spherical videos on it’s social media site and Youtube is planning a similar offering.